This article is part of a series detailing and explaining midterm elections that are relevant to Vanderbilt students. Given that more students come from Illinois than any other state other than Tennessee, VPR has thought it important to showcase these races. If you’d like to ensure your role in our political process, Online Voter Registration closes October 21st. In typical Illinois fashion, money truly spoke in both primaries. The two nominees, Bruce Rauner (R) and J.B. Pritzker (D) spent over $105 million in the primaries, more than $100 per vote cast. Republican incumbent Bruce Rauner held off conservative Illinois House representative Jeanne Ives in a surprisingly close race. Rauner secured the nomination with 51.4% of the vote compared to Ives’s 48.6%. On the other side, J.B. Pritzker smashed six other candidates and advanced to the General with 45.2% of the Democratic Primary vote. Included in those six were Daniel Biss, an IL State Senator, and Chris Kennedy (Yes, from the famous family). Rauner, prior to serving as Illinois’s 42nd Governor, worked primarily in the financial sector. He was the Chairman of private equity firm GTCR until 2012. Afterward, he had stints as the Chairman of Choose Chicago, the Chicago Public Education Fund, and a subcommittee of The Commercial Club of Chicago. He also served as advisor to Chicago Mayor Rahm Emanuel. Not to be outdone, Pritzker also has a long history in finance and venture capital. Other than also serving as an advisor to Mayor Emanuel, J.B. has served as Chairman of ChicagoNEXT, founded Chicago Ventures and 1871, and funded Techstars Chicago and Built in Chicago. His family owns the Hyatt hotel chain, and his sister, Penny Pritzker, served as Secretary of Commerce under President Obama. For issue positions, find Rauner’s here and Pritzker’s here. It is important to note that Rauner and Pritzker have significant on-hand funds. Rauner, a multi-millionaire, has $33.5 million on-hand and has raised over $78 million. Similarly, Pritzker, a billionaire, has $39.5 million on-hand and has raised a total of nearly $130 million. Some experts predict that this election could be the most expensive gubernatorial election in our nation’s history. After sailing through the Republican Primary, Peter Roskam is now locked into his 7th general election for the Sixth District. Sean Casten narrowly progressed from a crowded Democratic field. The Sixth District has has been targeted by the Democratic Congressional Campaign Committee (DCCC) as a potential seat to flip due to its 2016 presidential outcome and general demographics. Sean Casten has an impressive academic background in Business and Biochemistry. He moved to Illinois in 2007 and co-founded Recycled Energy Development LLC to reduce greenhouse gases and limit energy waste. Before moving to Illinois, Casten was the President and CEO of Turbosteam Corporation. Peter Roskam has served in the US House since 2007. Prior to that, Roskam held seats in both chambers of the Illinois General Assembly. From 2011 to 2014, Peter Roskam was the Chief Deputy Whip in the House Republican Conference. He narrowly edged out (now Senator) Tammy Duckworth in his initial campaign and has easily held the seat ever since. Roskam is the Chairman of the Subcommittee on Tax Policy which was instrumental in the passing of last year’s Tax Cuts and Jobs Act. For Policy Positions, click here for Casten and here for Roskam. A recent poll by NYT Upshot/Siena College shows Roskam with a narrow lead. Roskam took 45%, Casten secured 44%, and 11% of those surveyed were undecided. Unlike most of the other races covered, the primary election was nearly identical for both parties. Brendan Kelly (D) and Mike Bost (R) both faced only a single competitor for the nomination and won the primary election with over 80% of the vote. The DCCC has also targeted the Twelfth District as a potential pick-up seat in November. Mike Bost has served in the House since 2015. He successfully flipped the district from a Democratic incumbent and survived a second General Election in 2016. In both elections, Bost never secured more than 55% of the vote. Prior to serving in Congress, Bost has fulfilled roles in local governments, and served in the IL House of Representatives. Brendan Kelly is a former US Navy officer and comes a family that is devoted to public service. After obtaining a Law Degree, he became an Assistant State’s Attorney and served as an observer of Guantanamo Bay in the capacity of representative from the National District Attorneys Association. For Policy Positions, click here for Kelly and here for Bost. According to NYT Upshot/Siena College, this race looks very similar to that in the 6th District. Those surveyed broke down as 44% for Bost, 43% for Kelly, and 13% undecided. This is still well within the margin of error. Like the previous two, the Thirteenth District has also been targeted by the DCCC. 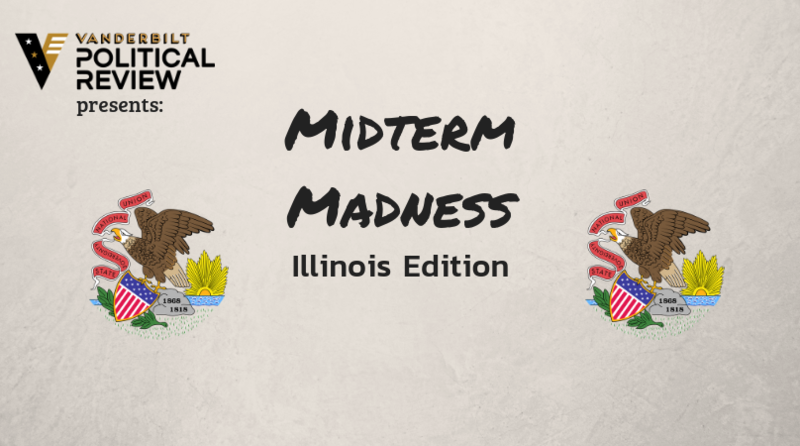 In a similar story to many of these races, Democratic nominee Betsy Londrigan secured the nomination after beating out a crowded field, while Rodney Davis ran unopposed for the GOP nomination. Betsy Dirksen Londrigan decided to run after realizing how important healthcare was in her family’s financial stability in the wake of her son’s hospitalization. She is a self-employed entrepreneur and has had experience in Illinois politics for 20 years, including working for Senator Durbin and the Abraham Lincoln Presidential Library Foundation. Rodney Davis has been the Representative for the 13th District since 2013. He is currently the Chair of the Republican Main Street Caucus. After earning a degree in Political Science, Davis worked for IL Secretary of State George Ryan and Congressman John Shimkus (both on campaign and congressional staff). According to The Lugar Center and the McCourt School of Public Policy, Davis was the 23rd most bipartisan US Representative. For Policy Positions, click here for Davis and here for Londrigan. As in the 13th, Randy Hultgren (R) ran unopposed for the nomination, while Lauren Underwood (D) triumphed over a sizeable field for the Democratic nomination. In this case, Underwood did receive over 50% of the primary vote. Like the previous three, the Fourteenth District has also been targeted by the DCCC. Randy Hultgren has served in the US House since 2011 and previously held seats in both houses of the General Assembly. Prior to his legislative career, Hultgren worked as a GOP Precinct Committeeman and as a Member of the DuPage County Board. Besides his initial election to the House, Hultgren has easily won reelection, never failing to beat his opponent by at least 15 points. Lauren Underwood is a registered nurse and was a Senior Advisor at the Department of Health and Human Services in the Obama Administration. She has also taught future nurses via Georgetown’s online program. During her time at HHS, she held to implement the Affordable Care Act. She worked with Medicaid in Chicago to ensure high-quality care. 7ymvV5 Your style is unique in comparison to other people I ave read stuff from. Many thanks for posting when you have the opportunity, Guess I all just book mark this site. How could I write blogs or articles as well as make money for it? I simply want to say I’m new to blogs and really loved your web-site. More than likely I’m going to bookmark your website . You absolutely come with terrific articles. Thanks for revealing your website.